TheArmenianKitchen.com : What makes coffee Armenian? We do, just by drinking it. What makes coffee Armenian? We do, just by drinking it. Our YouTube video showing How to Make Armenian Coffee is approaching 50,000 views, and the comments keep coming. Most have been enthusiastic but some have been downright nasty, and others genuinely obscene. This sure contradicts the idea that there’s nothing like a cup of coffee to bring people together. The complainers just can’t swallow the idea of Armenian coffee, which is simply the coffee Armenians drink. As our video makes clear, all cultures of the Near and Middle East consume remarkably similar versions of the same finely ground coffee heated to a frothy finish in a copper pot. When Greeks make it, it’s Greek coffee. When Turks make it, it’s Turkish coffee. We should probably all call it Ethiopian coffee, given the likely origin of the venerable bean. I don’t really care whose flag is stenciled on the wrapper, but I do care what’s inside. Despite its popularity around the world, good Armenian-style coffee isn’t easy to find in much of this country. Even at a Middle Eastern specialty store, you risk getting something that’s been on the shelf since the fall of Troy. He’d seen our website as well as our YouTube video and offered to send us some fresh-roasted Armenian coffee. It was if he’d somehow sensed that a fellow Armenian on the other side of the continent was thirsty! How could I refuse? Hrag was in fact kind enough to send three varieties of Armenian coffee: light, dark and half-and-half. We agreed to give each a taste test and relay the results to both him and to you, our readers. I’m delighted to report that all three were excellent: remarkably smooth with no bitterness—and absolutely no trace of lingering acidity that can be hauntingly familiar to patrons of certain American coffee chains. We all have our own frames of reference, but here’s mine: Henry’s Armenian Coffee compares to the tin-can grocery store variety as a good 12-year-old single malt compares to no-name bar Scotch. Robyn doesn’t drink Scotch, so her verdict was more direct: “Wow. This is excellent.” We both agreed that our favorite was the dark roast, with the half-and-half a close second. I liked the depth of both better than the light version. Interestingly, there’s no difference in caffeine content among the three varieties although many who try the light version think it’s super-charged because the density of the roast allows more coffee in each scoop. You can learn more about the subtleties and skill that go into a good cup of soorj by checking out the Henry’s House of Coffee web site. You’ll also find ordering information as well as pricing. As for what distinguishes Armenian coffee from any other, Hrag offers this answer: “In general, Armenian Coffee refers to the actual grind size (powder sugar consistency) and not necessarily the country of origin, or even the type of coffee." 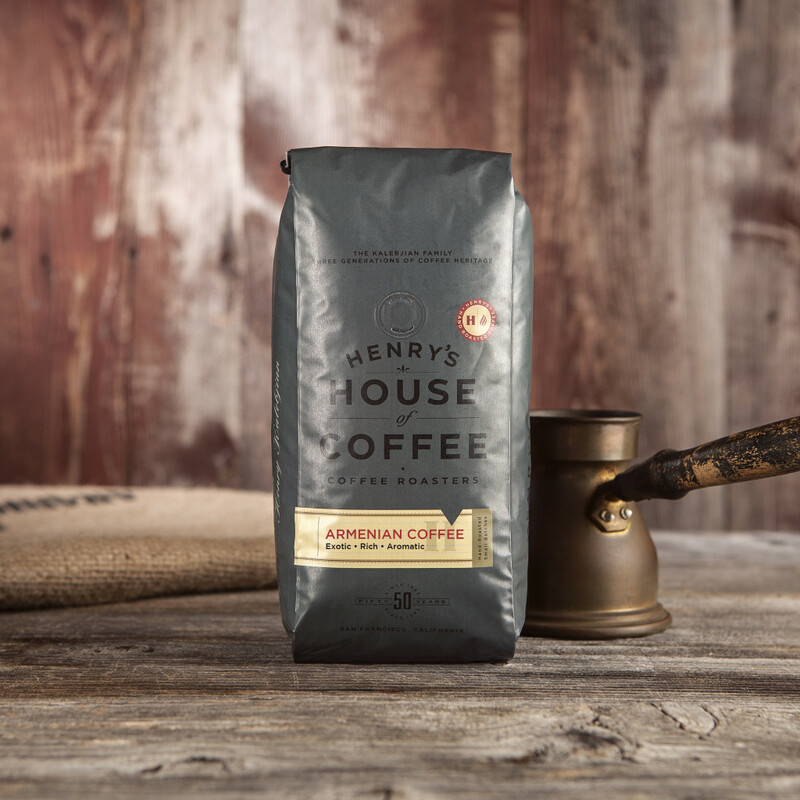 Henry's dark roast, for example, is made from a blend of beans from Central and South America. "You could technically take any type of coffee, grind it extra fine, and call it Armenian Coffee,” he said. I guess you could do that. But I think it's better when an Armenian does the grinding—and best of all, when this Armenian does the sipping!